- 205th Corps "Atal" (Hero) ( http://en.wikipedia.org/wiki/205th_Corps_(Afghanistan) ). The flag ( http://en.wikipedia.org/wiki/205th_Corps_(Afghanistan)#mediaviewer/File:ANA_205_Corps_Flag.svg) features the coat of arms (http://en.wikipedia.org/wiki/205th_Corps_(Afghanistan)#mediaviewer/File:ANA_205_Corps_SSI.svg) but all in yellow and green colors. - 207th Corps "Zafar" (Victory) ( http://en.wikipedia.org/wiki/207th_Corps_(Afghanistan) ). The flag (http://en.wikipedia.org/wiki/207th_Corps_(Afghanistan)#mediaviewer/File:ANA_207_Corps_Flag.svg) features the coat of arms (http://en.wikipedia.org/wiki/207th_Corps_(Afghanistan)#mediaviewer/File:ANA_207_Corps_SSI.svg). The ANA Special Forces were first conceptualized in 2009 and established in 2010. The first Special Forces team, whose soldiers were selected from the ANA Commando Brigade, finished training in May 2010. The organization is based on U.S. Army Special Forces. These candidates are normally selected after serving 4 years as a Commando. They were attached to teams of U.S. Special Forces operating in Kandahar province in the 2010 operation. In May 2010 the first class of the ANA Special Forces graduated from their 10 week qualification course and moved on to the operational portion of their training. In November 2010, the ANA Special Forces Class 1 received their tan berets after completing 26 weeks of on-the-job training partnered with U.S. Special Forces. The initial selection involved taking the 145 commandos who volunteered, putting them through a one week qualification process (similar to the one used in the United States), and finding, as in the U.S., that only about half passed. These men formed the first four A-Teams (of 15 men each). Some of them who passed the 1st are being used to help American Special Forces train the 2nd class of candidates. Special Forces soldiers are trained to focus on interaction with the population through jirgas with village elders, but capable of unilateral operations. A second ANA Special Forces class completed training in December 2010. The force numbered between 1,000 to 1,500 in December 2011.This unit also has female soldiers to act as support to deal with female civilians, such as searches, interviews or medical examinations. There are plans to create one special forces platoon of just female soldiers so they can go talk to families (women and children). The ANA (Afghanistan National Army) Commando Brigade is part of the Afghan National Army and was formed from existing Infantry battalions. The program was established in early 2007 with the intent of taking one conventional battalion from each of the ANA Corps, giving them special training and equipment and reorganizing based on a United States Army Rangers Battalion. Each Battalion is assigned to one of the 5 military corps. - http://en.wikipedia.org/wiki/File:Afghan_soldiers.jpg (source: http://en.wikipedia.org/wiki/Afghanistan#Foreign_relations_and_military). 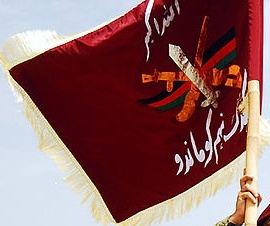 In this picture one can see two flags: the one on the left seems to be the War Flag (Afghanistan flag with probable related ANA Commando inscription, battle honours or maybe the corresponding military training facility's name), and on the right one can see the Standard (purple flag). (source: http://www.marinecorpstimes.com/news/2010/05/army_afghan_special_forces_051810w/). This is probably the War Flag. The flag (Standard) is a purple horizontal flag with the logo (http://picasaweb.google.com/clayton.perce/YourExperienceMayVary#5438373780028325298, source: http://cperce.wordpress.com/2010/02/15/kudos-from-afghanistan) plus an inscription on top and on the bottom in Arabic in white letters. In July 2007 the ANA graduated its first Commandos, after three months training. By the end of 2008 there were six ANA Commando Battalions. From mid-2011, the ANA began establishing a Special Operations Command (ANASOC) to control the ANA Commando Brigade and the ANA Special Forces. In July 2012, the Special Operations Command was officially established as a division-sized special operations force formation, including a command and staff. The command, with the status of a division, now boasts between 10,000 and 11,000 soldiers. Previously this was organised as one Brigade with 8 battalions. Due to the standard size of a brigade in the ANA, the ANASOC is likely to be split into 3 - 4 brigades, one of which will be a Special Forces Brigade. - 8th Commando Battalion "Lamer & Sun"
- 9th Commando Battalion "Cobra"
The flag of the Commando Brigade (http://en.wikipedia.org/wiki/ANA_Commando_Brigade#mediaviewer/File:ANA_Commando_Brigade_Flag.svg) has the Badge (http://en.wikipedia.org/wiki/ANA_Commando_Brigade#mediaviewer/File:ANA_Commando_Brigade_SSI.svg) featured in the middle of the flag.